How much is the train fare? but of course there’s also people who can’t drive, or don’t want to, or don’t have a car. How do those people get around? Most of them use public transportation"
Unlike America, in Japan there’s a lot more people using public transportation than driving their own cars. specifically, trains, busses, and taxis! When people first visit Japan from America, the train system can be pretty overwhelming. and even when they do, there are usually only a few different lines. 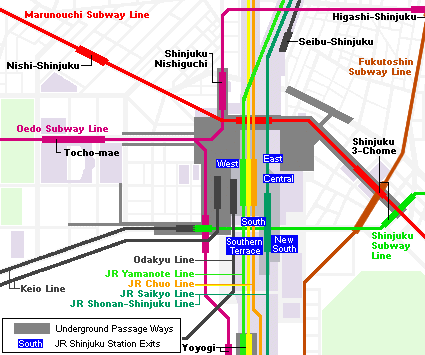 Japan, on the other hand, can have way more than 5 different lines at a single station. Not only that, but even within a single city there can be train lines operated by multiple companies. It’s definitely complicated if you’re not used to it! よく見たら10路線ほどある... / Shinjuku Station has TEN different train lines. Another big difference is that Japanese railways in general are known to be of higher caliber. The biggest reason behind that is the fact that for the most part the trains are always exactly on-schedule. In places like America and England, trains can very often be late or leave early for no apparent reason. For most lines in Japan, delays are announced and the reason for the delay is given. Also, though it’s not necessarily universally true, America’s subways are thought of as relatively unpleasant. The common image is of graffiti, broken seats, and homeless people. Of course you’ll see raucous drunk people and the like on Japanese trains, but it’s an exception to the norm. クマネズミもたまにいる。 / Also sometimes there’s rats. When talking about busses, there’s really two different kinds: city busses and highway busses. First let’s talk about city busses. The biggest difference I can think of between Japan and America’s city busses is the reasons people use them. In Japan, city busses are pretty similar to the railway in that they’re just another way to get around. Riding the bus in America, though, can sometimes come with an image of being poor. Essentially the thought process is that if you could afford a car, you wouldn’t be riding the bus. In other words, some people in the States think of taking the bus as something you only do if you HAVE to. There aren’t a lot of huge differences between highway busses either, but it seems like they’re probably used a lot less in the US. It’s not out of the ordinary to not own a car in Japan, so highway busses can be pretty convenient when you want to go somewhere far away. In America, though, a good number of people already own a car and just use that for long-distance travel. On top of that, the country is so big that it can take a bus tens of hours to get between cities, so usually taking a plane is a better option. 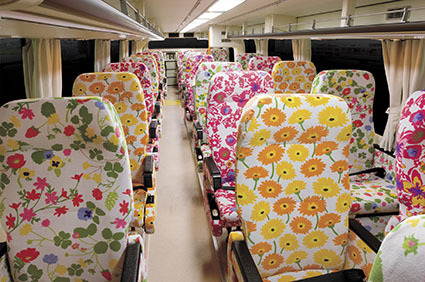 Another small difference is that in Japan there are ladies-only highway busses, as well as seating policies designed to put women more at-ease. こんなバス、アメリカには絶対に無いと思います。 / I don’t think there’re any busses in America like this. Not unlike American subways, American taxis don’t exactly have the prettiest image. 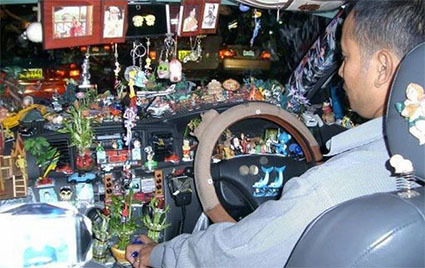 Until recent years you couldn’t always expect that your taxi driver cleans his car all too often. even if you don’t say a word back to them. こういうタクシーもたまにはあります。 / Sometimes you’ll even run into a taxi like this. The flip side of the coin is that Japanese taxis are a heck of a lot more expensive. I haven’t calculated actual figures, but prices seem to be about three times higher here than in the US. Late night is the prime time for Japanese cab drivers, because most if you miss your last train you don’t have any other way to get home. Also unlike America, most Japanese taxi drivers are pretty taciturn. A US cab driver might do something like call a friend while they have a fare, but that would pretty much never happen in Japan from what I can tell. This is "traffic system" by Bubble-B. It’s about preventing congestion on trains, busses, and the like. By the way, I was recently a guest on Bubble-B and m1dy’s "これ、食えますか？" podcast, so check it out if you have a chance. In America, if you don’t have a car it can be tough to get out to see your friends. But in Japan, you can get pretty much anywhere even without a car, it’s pretty great. That being said, driving itself is pretty fun so I’ll hopefully get a car here at some point in the future.